The final four years of Prohibition saw over two hundred New York City gangsters shot, garrotted, or stabbed to death with ice picks. Some simply vanished never to be seen again. 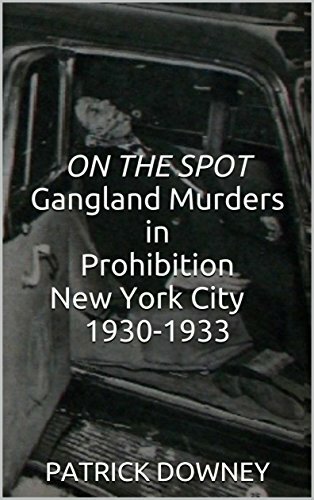 My new ebook: ON THE SPOT: Gangland Murders in Prohibition New York City 1930-1933 brings these murders back in full detail. 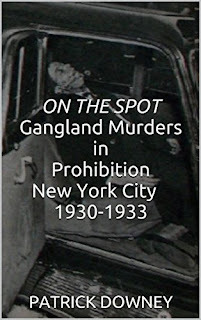 In addition to all of the bootleggers, drug dealers, gamblers and other underworld sorts who were "bumped off", "taken for a ride", and "put on the spot", the reader will learn about the victims of the gang wars fought between Dutch Schultz and Vincent Coll, Waxey Gordon and the Bugsy Seigel - Meyer Lansky mob, the Mafia's Castellammarese War and the battle waged between Brooklyn's Shapiro Brothers and the boys from Murder, Inc. Over two hundred gangland executions are discussed, most for the first time since they occurred all those years ago. The cliche is true: A picture is worth a thousand words. As such, why not kick off a periodic series that looks behind the still photos and hopefully reveals a few more gangland goodies in the process. Let's begin with the 'Bug & Meyer Mob' - circa 1928. Around 5:30 pm on January 29th, 1928, John Barrett arrived to a residence on Forty-Fourth Street in Sunnyside Queens. Louis 'Lepke' Buchalter was the host, and although Barrett would later call the gathering a 'party,' it was more likely organized as a 'sit down' type of event. A group of individuals hailing from both the Bug and Meyer Mob and Lepke's gang commiserated for several hours. Accounts of what exactly took place during and after the gathering are varied, one of which suggests Lepke, technically being from a separate gang, would make a good arbitrator, albeit a bias one. Barrett plead his case and/or defended his actions. Lekpe, ironically a man who some would later refer to as the 'Judge,' allegedly sent Barrett out of the room so a decision could be made. We can all pretty much assume what that verdict entailed. Sometime close to 8:30 pm, Barrett was coerced or forced into an automobile, where he was told to sit shotgun. Next to him was the driver; behind him were three other men. The quintet traveled only a few blocks when someone in the back seat drew a pistol and fired at Barrett. The round struck Barrett in the back of the head (he later described feeling like he was hit with a blackjack). Immediately realizing he was being 'taken for a ride,' Barret claimed he kicked Siegel's foot off the gas, and leaped from the vehicle. The would-be victim, bleeding but very much alive, did in fact make a run for it and successfully hailed a taxi. The cab driver, however, had no idea where the nearest hospital was located, so Barrett opted for a trip to his parents' house at 523 Grand Street in Manhattan, just a few doors down from his own residence. To his mother's horror, Barrett arrived bloodied and frightened, so she quickly summoned an ambulance from Gouverneur Hospital. Police from both Manhattan and Astoria became involved after the hospital reported Barrett's injury. From his hospital bed, Barrett had no reservations in divulging the identities of his assailants to detectives. 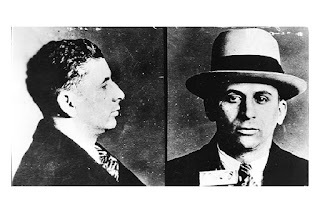 He explained where he had been, that he was trying to collect $5000 owed to him by some of the attendees, and who was in the vehicle - specifically naming twenty-three year old Meyer Lansky, of 125 East Third Street, Brooklyn, as the shooter. Initially, Barrett told police the driver was Benjamin Siegel, and the two other passengers were Joseph Benzola (aka Benny the Gambler, Bennie Benzola) and Samuel 'Red' Levine. That story changed over time, quite dramatically. March 7, 1928. Three of the four men originally named as 'assailants' by John Barrett had already (and willingly on the advice of their attorney) turned themselves in to police. The defendants were Meyer Lansky, Joseph Benzola and Samuel 'Red' Levine (Siegel had not been arraigned). All of the aforementioned had rap sheets that, combined, consisted of assault, narcotics and robbery charges. None of the trio admitted to any wrongdoing of course, but were facing Felony Assault charges in the Long Island courtroom of Magistrate Benjamin Marvin. Barrett, however, suddenly succumbed to an ill the judge had witnessed time and time again. 'Not them,' Barrett told the judge; the accused were not his attackers. Barrett didn't know who tried to kill him, but it wasn't the three standing before him in court. Magistrate Marvin was appalled and threatened Barrett with a charge of perjury. The effort was futile; Barrett wouldn't budge. After spending two weeks recovering in the hospital, and a couple weeks thereafter in the care of his parents, Barrett completely recanted his accusations. "They have had so much experience in courts that it's a waste of money to get lawyers," the aggrieved magistrate proclaimed. "This is the best drilled thing I ever saw." With that verbal condemnation, the judge dismissed Lansky, Levine and Benzola. As the trio began to exit, Manhattan detectives were ready in wait to take custody of all three, as suspect in a robbery investigation (Siegel was also picked up again). And as the suspects were led away, the dispersing courtroom audience garnered some colorful description by a reporter from The Daily Star. "Fully half of those present followed them (Lansky, Levine, Benzola) out," the newspaper remarked. "Shifty-eyed men hurrying from the courthouse and disappearing in different directions when they reached the sidewalk." Joseph Benzola Sing Sing, 1930. What Happens in a Hospital Room... It Doesn't Stay There, Apparently. Decades after the Barrett incident, another Bug and Meyer 'associate' revealed what took place between the time Barrett was shot and when the Magistrate heard the case. These 'revelations' were made during the INS deportation attempts against Meyer Lansky. 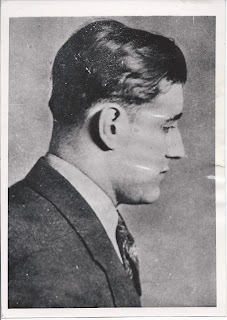 Daniel Ahearn, the teller of the tale (serving a thirty year prison sentence at the time), spoke at length on the subject, detailing an elaborate and sinister scheme hatched by Lansky and Siegel, one that would put Barrett in the grave for good. The plot involved Ahearn himself who, as a trusted Barrett friend, was to bring a chicken dish to the hospital. That chiboni was poisoned, and as fate or common 'mob' sense would have it - Barrett declined the food. Barrett had the chicken examined and sure enough it was laced. Allegedly, he spoke aloud, pointing the finger directly at Lansky's Italian friend - Charles "Lucky" Luciano. "That's Luciano's way," Barrett hissed. "They kill sneaky." Later, while continuing recovery at his parent's home, Barrett instructed his mother to allow nobody access, no friends were permitted to visit (though a few made attempts). The entire situation did however encourage Barrett to back-peddle when the case went to court. And, Lansky chose not to retaliate any further, assuming (or so it has been said) that Barrett learned his lesson and would be loyal from then on out. Back to Ahearn though, his motivations for bringing up the thirty-year old case was likely two-fold; he may have been hoping for some leniency in the thirty year incarceration he was enduring, and, perhaps bad blood still ran through his veins. After the Barrett incident, a feud developed between Ahearn and Bugsy Siegel directly, with Lansky indirectly (he always sided with friend Siegel). That feud led to drive-by shooting (allegedly carried out by Siegel) of which Ahearn -hit by several rounds - narrowly survived. Lacey, Robert. Little Man: Meyer Lansky and the Gangster Life, Little, Brown & Company, 1991, p. 56-59. "Wounded, Blames Others in Auto," The Brooklyn Standard Union, January 30, 1928, p.3. "Swears Accused Are Not Ones Who Attacked Him," The Daily Star, March 8, 1928, p. 3. FBI, Subject: Meyer Lansky, File Number 92-2831 Sub A, p. 15. FBI, Subject: Meyer Lansky, File Number 62-97928, p. 2-8.